For some 50 years, the story of Nisei draft resisters was virtually written out of popular Japanese American history texts, which overlooked the group of young men who refused to be drafted for military service while they and their families were imprisoned behind barbed wire in wartime concentration camps. A renewed interest emerged as the once ostracized group of men — labeled as “cowards” or “traitors” by so-called Japanese American leaders and the U.S. government — became seen in a different light. While the story of the Nisei resisters is trickling into the collective consciousness here, it is surely unknown in Japan. But thanks to research by a Kanazawa University professor, who spent the last five years interviewing the Nisei resisters and meticulously pouring through American historical archives, a story that has been at the heart of intense community controversy since World War II will see some light in a new country. Published by Tokyo’s Sairyu-sha Publishing Co., “America Nikkei Nisei no Chohei Kihi” (American Nikkei Nisei Draft Resistance) is a comprehensive 638-page volume documenting the once shunned history of a group of young men who are now heralded for their principled stand for civil liberties. Prosecuted by the government as criminals and ostracized as traitors by Japanese American leaders and veterans, these principled protesters served prison terms. The book includes results of interviews with Nisei resisters. The book also includes a chapter on Nisei journalist James Omura, a lone editorial voice in support of resistance whose ostracism was so severe, he led a life of self-imposed exile after the war. A 1965 Fulbright Scholar, Morita earned a master’s degree in history from both Kyoto University and Ohio State University, and currently teaches part-time at Kanazawa University. He previously taught in both the literature and journalism departments at Kanazawa Gakuin University, and prior to that taught American history at the Aichi Prefectural University in Nagoya. He first heard about the resisters in the latter part of the 1980s, and was drawn to their story. 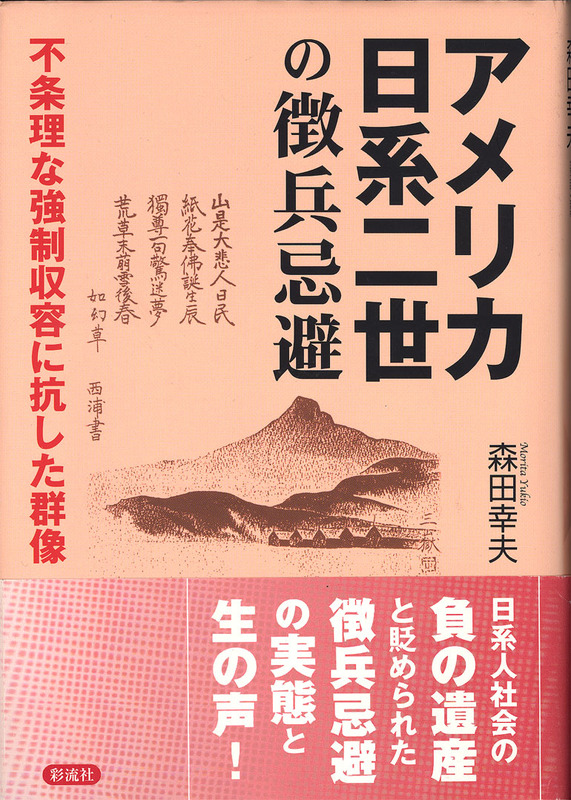 While this is the first book originally written in Japanese on Nisei resisters, it is not the first Japanese language book on the topic in general. Eric Muller’s “Free to Die for Their Country: The Story of the Japanese American Draft Resisters in World War II” was published in English in 2001, and then translated into Japanese thereafter. What sets Morita’s book apart from Muller’s is that it includes the histories of Granada (Amache) and Topaz concentration camp resisters. Morita was taken by the resisters’ stubborn determination to take a stand. Morita has a simple message that he wishes his book conveys. While over the years, much has been said or written to place Nisei veterans diametrically opposed to Nisei draft resisters, Morita instead sees similarities in the positions they took. Nisei veterans “tried to show what American democracy is abroad” while Nisei resisters “tried to correct democracy” or “tried to correct wrongs to democracy,” he added. The issue came to a head in 2000, when an effort by some JACL members to have the group apologize for its suppression of wartime resistance culminated in a heated vote at the organization’s national convention on July 1 of that year. On May 11, 2002, the JACL held the Nisei Resisters of Conscience of World War II Recognition and Reconciliation Ceremony in San Francisco, in an attempt to atone for its treatment of the resisters and for its failure to recognize their stand. But the results of the historical community ostracism still lingers. “Some draft resisters are still afraid of being criticized by the JACL and wanted their comments omitted from the book,” said Morita. Morita realizes that his book may have a limited audience in America, given that it is written in Japanese.